2. Use a moisturizer that contains Aloe Vera to help soothe sunburned skin. If a particular area feels especially uncomfortable, you may want to apply a hydrocortisone cream that you can buy without a prescription. Do not treat sunburn with "-caine" products (such as benzocaine), as these may irritate the skin or cause an allergic reaction. 4. Drink extra water. A sunburn draws fluid to the skin's surface and away from the rest of the body. Drinking extra water when you are sunburned helps prevent dehydration. 6. Take extra care to protect sunburned skin while it heals. Wear clothing that covers your skin when outdoors. Tightly-woven fabrics work best. When you hold the fabric up to a bright light, you shouldn't see any light coming through. While a sunburn is temporary, it can cause long-lasting damage to the skin. Don't forget to protect your skin this summer and take the appropriate steps to help your skin heal after a sunburn. 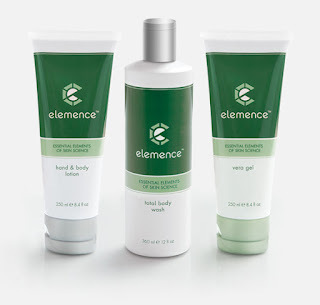 Now through August 14, Synergy's entire Elemence Body Care line is available for the first-time ever in a set for just $36. These products unite the most advanced research and cutting-edge technology with rich botanicals and vitamins to provide you with the very best cleansing, moisturizing, and treatment for your skin. It's the perfect set for daily use, and you'll be ready with Elemence Vera Gel when the sunburn comes.